So here is where their nightmare comes to an end. After 18 years of falsified imprisonment, legal battles, unrelenting suspicion and a documentary filmmaker’s camera as their only link to the outside world, the West Memphis Three arrive at the center of “Paradise Lost 3: Purgatory” having learned the harshest lesson about our flawed legal system, and their reward is their own freedom. But at what cost? Two decades of their lives have been lived in isolation for ludicrous reasons, a devastated community spent all their emotional energy on the wrong targets, and the deaths of three eight year olds have gone without justice because an incompetent police force was too careless in their pursuit of facts. And even after the turmoil, none of those involved in the false convictions ever shows the slightest hint of spine; they resolve to their pompous rhetoric that those convicted were done so in a clean case, and the state’s eventual decision to free them based on reduced sentences instead of full exoneration is a spit in the face. Seldom has a film inspired so much dislike in viewers towards the very system designed to protect them. The full sweep of the “Paradise Lost” documentaries shows filmmakers Joe Berlinger and Bruce Sinofsky in full possession of an investigative nature that isn’t so much informative as it is arresting, and their ability to inspire actual change through the dissenting voices of a national audience results in one of the great landmarks of this genre. I saw all three films for the first time in a recent 48-hour period; intrigue and befuddlement were my responses to the events of the first, while the second filled me with sadness over an obvious injustice. All of those feelings devolved into utter outrage, however, as a result of what occurs in this endeavor, and no wonder: people sworn to protect us and uphold justice have taken away a sizeable chunk of these young and promising lives, and in turn have likely allowed the true culprits to wander free. How do they sleep at night, knowing their inept decision-making was at the root of a criminal investigation that sabotaged fact for delusion? The gap of time between “Revelations” and “Purgatory” is significant – 12 years, to be exact – but the events between them are no less critical. In 2007, new forensic evidence that refuted the possibility of Damien Echols, Jason Baldwin and Jessie Misskelley being present at the 1993 murders was discovered and tested, and the findings inspire the defense team – most of which were hired on after the initial convictions – to take yet another stab at an appeal process. Arkansas, we are informed, has a law on the books that allows newly found DNA evidence to be used in an appeal for a new trial, which is critical not just in potentially freeing the suspects, but also getting Echols off of Death Row. The new evidence also establishes another suspect: Terry Hobbs, stepfather to one of the dead boys, whose own cross-examination in a related lawsuit against the Dixie Chicks for slander reveals an extremely violent past, and neighbors revealing how they saw all three boys in Terry’s yard the night they apparently went missing. Such facts also raise the eyebrow of Pam Hobbs, who has come around to believe that he West Memphis Three were not responsible for her son’s death but thinks an inquiry into her former husband’s whereabouts on that fateful night so long ago are warranted. Also coming around to the angle of innocence is John Mark Byers, the religious zealot who chewed up scenery in the first two movies by violently cursing at the accused for mutilating his stepson. The DNA findings have given him a change of heart, and in an amazing sequence early on he receives a letter of apology from Echols that exhibits maybe the first step in mending fences in this nightmare. Other findings. 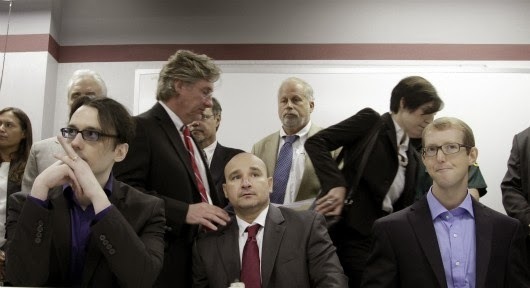 An assistant to one of the prosecution lawyers suggests that she overheard him discussing the case with the foreman prior to the verdict being decided (implying jury tampering). Many of the “tear” marks on the victims may have not actually been cuts from a knife – as it was suggested during the trial – but rather claw marks from wild animals (their bodies were in a feasible location for such a scenario). In addition, Terry Hobbs, whose own hair was discovered on a shoelace used to bound the victims during their murder, has no alibi for the evening of May 5 and (by his own admission) was wandering in the woods sometime that same night. Most of this material is shown in a press conference that occurs just before the actual appeal, and the forensic experts who discuss the findings are clearly established as such with decades of experience. This is contrasted (perhaps intentionally) by revisiting the “mail-order certified” occultist expert from the first film, who adds to the intrigue by informing the audience that he had been contacted by West Memphis police long before the murders in order to profile Echols. If the real villainy was committed by uninformed observers in a town knee-deep in satanic hysteria during the original trials, then “Purgatory” now isolates what remains of that to very specific individuals: the retired police chief Gary Gitchell, prosecution attorney John Fogelman, and Judge David Burnett. Lengthy interviews with the former two suggest they have no remorse in the proceedings that led to the conviction of three innocent teenagers, while Burnett’s influence in the continuing debate calls blatant integrity into question. Not being familiar with Arkansas law per se, how was it possible that, up through 2009, the same judge who presided over the original trials was also the one hearing all of the appeals? Like a broken record, Burnett’s conclusive judgment is one of “leave it alone,” even in the face of DNA evidence that created a reasonable doubt in the guilt of the convicted. As the movie draws to a close with this reality, the hands of fate close more tightly around the throats of the three convicted men. But then, at last, an 11th hour victory. The new evidence comes to the state’s Supreme Court chambers, and the residing justices agree with the findings of the defense team: a new trial will be set for the end of 2011. Burnett is elected to the state senate, which removes him from the judicial process. And then shortly before this movie was scheduled to make film festival rounds, the legislature called for a last-minute hearing with the suspects in order to offer them an “Alford” plea deal (a legal maneuver that allows the defendants to plead guilty to a lesser crime while still maintaining their own innocence). On August 19, Damien Echols, James Baldwin and Jessie Misskelley walked out into the streets as free men: 18 years and 78 days after they were imprisoned. And they do so exhausted and disheartened, but not bitter. There is an outlook in them that is miraculous considering what they have endured. One day the record books may even fully clear their names, and the true culprit of these crimes may be caught. But those cannot be silver linings in a cloud that could have easily been avoided with proper investigations. For them – and indeed, for all of us – paradise isn’t really lost; it was only an illusion.